Herbal bath in Sapa Vietnam, spending the whole night on the train and some more hours on a coach, I finally travel in the tourist town of Sapa. Being exhausted, I only wanted to take a nap but Phuc, a local friend of mine, said, “Don’t sleep, that’s a waste!” and brought me to a … public bathroom. Having just entered the bathroom, I immediately caught a whiff of fragrant herbs. I scooped my hands into the viscid, dark red water inside the wood-bathtub and threw it on to my face to feel the warm and fragrant water. I then entered the bathtub to immerse my whole body in the herb water. Sweat beaded on my forehead and dripped from my head. Each pore relaxed to absorb the herb water to each fibre of my body. Around ten minutes later, I clearly felt the recovery in my body. After the whole 35-minute period, my body was refreshed. The owner of this public bathroom, the most famous herb bathing service in Sapa Town, Le Van Minh, said that as a member of the local traditional art troupe, he often went to mountainous villages to collect traditional songs and dances of ethnic minority people. Once in the village of Red Dao, he caught a heavy cold. 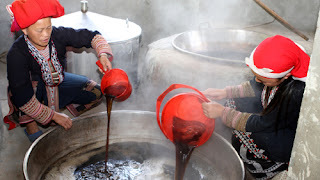 The locals quickly treated the cold by putting Minh in a big wood cask full of red water. They told Minh that they used a traditional remedy of herbs which has existed for hundreds of years. 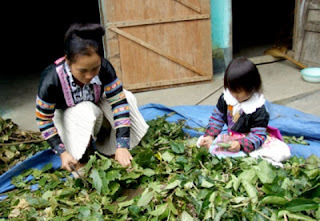 As he lived in Sapa Town, a famous tourist site in Vietnam, Minh immediately thought of using this traditional herb remedy of Dao people to serve tourists. He successfully convinced some Dao families to transfer their traditional remedies to him. Minh has built nine bathrooms to serve tourists for the past year. Herbal bath in Sapa, each herb remedy for bathing includes 12 to 14 kinds of herbs, plus three kinds of herbs from Minh’s family. 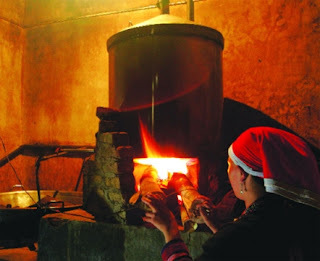 The herbs are boiled for 3-4 hours to extract the essence, and then mixed in water to serve tourists. According to Minh, the herbal essence accounts for 2% of the total volume of water in the bathtub and water must be 30-37oC. Healthy people should soak their body in the bathtub for 30-35 minutes and 20-25 minutes for weak ones. After the bath, massage and point acupuncture can help people recover their health. The fragrance of herbs will be on the body for up to three days later. Minh’s public bathroom welcomes around 30-70 customers a day. The service price there is quite cheap, VND50,000 ($3)/person/time. He also sells dried herbs for VND20,000/kg ($1.25). 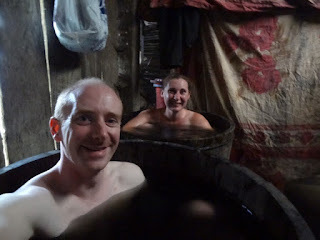 Medical bathing in Sa Pa 4Herbal bath in Sapa, at a public bathroom in Sa Xeng village, Ta Phin commune, Sapa district, Lao Cai province, I saw four foreign visitors who had just left the bathrooms. They smiled and said, “Number one”. The bathroom’s owner, a Dao ethnic women named Ly May Chan, said that she opened this public bathroom nearly five months ago and the service had been attracting many visitors. Chan is convincing villagers to build a larger public bathroom of over 100sq.m. Chan and her friend are trying to commercialise the bathing herb remedy. However, six kinds of herbs in the remedy are facing extinction so they are trying to plant them. 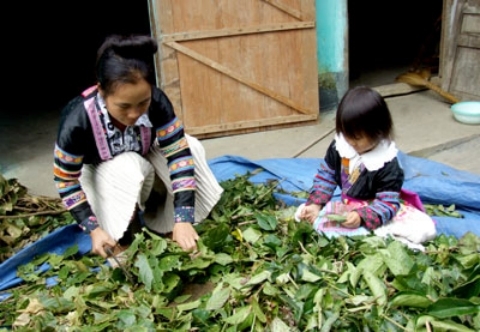 Dr. Tran Huu Son, director of the Lao Cai provincial Department of Culture and Information, said that Dao people often used herbs to bath all the year round. Their traditional herb remedies for bathing can include from ten to 120 kinds of herbs, which help bathers refresh their bodies, make their skin smooth, and can cure some kinds of diseases like rheumatism, pain in the bones, colds. To turn those remedies into unique tourism products, many organisations have helped Dao people to process herbs into resin or powder for easy use. 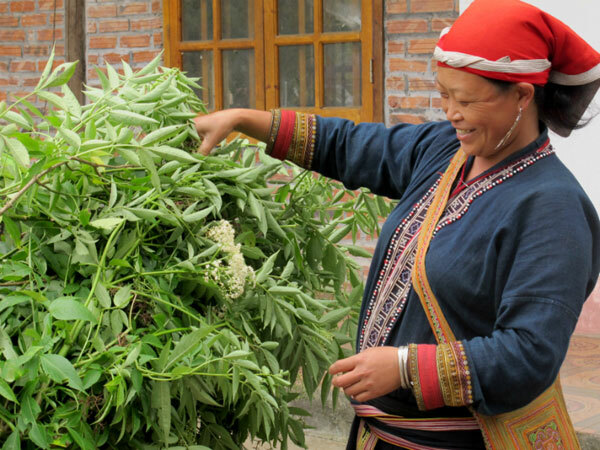 The Global Environment Fund is implementing a project to help preserve the valuable genes of herbs and help locals to plant herbs in their gardens.There are 11 public bathrooms using the traditional herb remedies of Dao people in Sapa town and Ta Phin. Herb bathing has become a unique tourism product of Sapa.